Here you'll find all the files, resources and video to accompany issue 218 of 3D World magazine. To download the accompanying files for 3D World issue 218, simply click the link below each article and a zip file will automatically download the content to your Mac or PC. 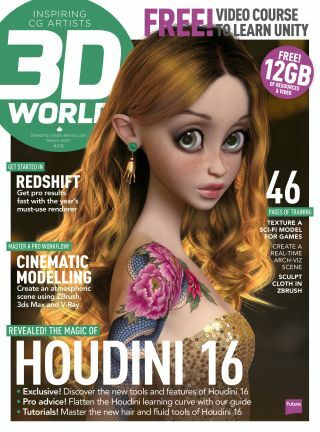 If you've missed this issue or other editions of 3D World, order a copy here. This issue, we’ve joined forces with Pluralsight to offer you a comprehensive video-training course that you can download from our online Vault – for free! In this course, Authoring Real-time Destruction in Unity 5, you’ll create a destruction FX system to simulate a wooden bridge collapse using rigid bodies, physics joints and particle effects, as well as writing some C code to provide art direction control that will allow you to perfectly choreograph the destruction sequence. By the end of this course, you’ll be able to create a wide range of destruction systems, from bridges and buildings to environments and vehicles. You’ll need Unity v5.3.5 to do this fantastic video course. Download extra images, art and step-by-step tutorials, models and video walkthroughs for this issue's reader showcase projects. Andrey Belichenko shares how to make the most of Houdini 16’s new set of tools to make fantastic-looking hair. Download the step-by-step images to follow the settings. Get up to speed with Redshift and create amazing-looking professional renders with these tips and tricks from Varomix. Download the artist's step-by-step images and follow along to the video tips and walkthroughs. Ryan Ng reveals how Houdini 16’s new Suction Fluid tool can be used to create stunning renders of suctioned fluid. Download his step-by-step images to follow the training. Jingtian Li explains his workflow for creating a rich environment for arch-viz using Unreal Engine 4. Download his step-by-step images to follow the tutorial. Piers Coe reveals how a Substance Painter and Modo pipeline can speed up your creature workflow. Download the step-by-step images. Gustavo Åhlén shares how to composite an atmospheric scene using different CG techniques in ZBrush, 3ds Max and V-Ray. Download Gustavo's step-by-step images and complete video walkthrough. In the second of a two-part tutorial, Victoria Passariello shows how to create textures for an in-game model in Quixel. Download the model she uses, plus step-by-step images and video walkthroughs. Download the hi-res step-by-step images to follow this issue's Artist Q&A tutorials covering skin rendering in Maya and Arnold, cloth sculpting in ZBrush, Marvelous Designer tips and much more. Get the videos, models and more to follow the artists' advice. Meet the Humster3D car challenge winners in issue 218 of 3D World and here, download their process art, WIPs and workflow images to get closer to the winning renders.